America’s national debt swells more in an hour than most of us will earn in a lifetime. The numbers are frightening. And fear is easy to manipulate. Yet not everyone sees the debt as a national crisis. Some argue that the United States, because it prints the world’s favorite currency – the dollar – and enjoys a solid reputation among investors, is simply taking advantage of its unique position. 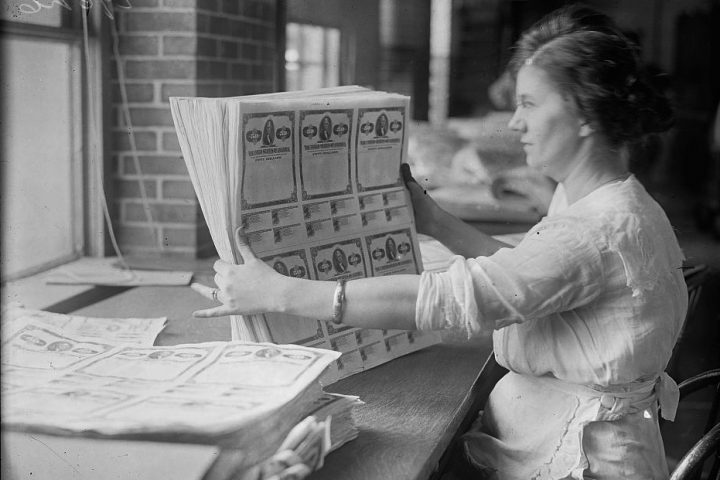 Corporations, governments, money managers and private individuals lend to the U.S. government in exchange for small payments (the interest they receive) because the U.S. Department of the Treasury – the body with the near magical power to print dollars – is widely seen as the safest place in the world to store money. A long history of fiscal probity and rule of law has shaped the consensus that no one offers a safer haven. When someone lends to the U.S. government, they receive Treasury securities – “bills” of one year or less; “notes” of one to 10 years; and “bonds” of 20 to 30 years. These are essentially I.O.U.s that return a small, regular payment until they mature, when the holder can cash them in for face value. Because the U.S. is such a safe haven, these I.O.U.’s offer exceptionally low interest payments. The national debt is a sum of many different figures, all oscillating to the cadence of government spending, tax receipts and the constant buying and selling of those Treasury securities. Hence, the numbers used to describe the debt are vulnerable to cherry picking. The debt rose sharply during Barack Obama’s administration, as he borrowed to dig the U.S. out of the Great Recession and to rescue ailing industries. At the same time, the recession led to lower tax receipts (fewer people working meant fewer people paying taxes). Looking ahead, President Donald Trump has proposed to cut tax revenues over the next 10 years by at least $6.2 trillion, according to an October 2016 estimate by the Tax Policy Center, a nonpartisan think-tank. If he does not cut spending by a comparable amount, the debt will rise accordingly. But is government debt as bad as many right-leaning politicians argue? When the government spends more than it collects in taxes, the money does not simply disappear. Often it is used to pay individuals or companies for services or goods; the money is moving into the private sector. In theory, the private companies then earn more money and pay higher taxes. Or the future generations that use a bridge built with debt are more productive and pay higher taxes. For a powerful government, owing money is not as risky as it is for an individual or corporation. If it were the other way around, if private individuals and companies were so heavily indebted, the economy would be in chaos. Think of the mortgage debt bubble that led to the Great Recession. Unfortunately for the future generations we expect to pay off our debts, borrowing these days often funds social programs (Medicare and Social Security, for example), which rarely fuel growth. Some people find this so alarming that they voluntarily send Uncle Sam earmarked contributions to pay down the debt. In 2016, $2.7 million in private donations helped the United States government pay off 0.0000001875 percent of the total. The federal government accepts gifts (which are not tax-deductible) by check, credit card and PayPal at Pay.gov. When reporting on the federal debt, the press often cites the figure for “total public debt outstanding” or “gross national debt.” In early February 2017, this was about $19.9 trillion. Yet budget experts rarely reference that figure because it includes money the government owes itself – funds the Treasury has borrowed from itself to pay for outstanding obligations, also known as “intragovernmental holdings.” Instead, a more accurate figure is the debt owned by the public. This is money the government owes to ordinary people, corporations, foreign countries and banks. Known as “public debt” or “sovereign debt” or “government debt” or “net government debt,” this was about $14.4 trillion in early 2017. The Treasury Department releases daily updates for both of these figures. Anyone who buys Treasury bills, notes or bonds owns American debt. These are America’s creditors. Some are private American investors and banks. American states and local governments buy securities. The U.S. Federal Reserve Bank also buys and sells debt to affect monetary policy and interest rates. And if you have a retirement account such as a 401(k) or own a mutual fund, there’s a good chance you own some of this debt, too. When more people want to buy U.S. debt, the interest rate falls. That’s a function of supply and demand: When demand for Treasury securities is high, the price is high (the buyer is not getting much in return; that’s the high price of holding U.S. debt). If the risk is higher (say Russian government bonds), there will be fewer buyers; to attract them, the interest rates are higher. Since the Great Recession, U.S. securities have offered historically low returns, making the cost to the government (what it pays in interest) very low. For any debtor, the risk is that debt becomes impossible to service (to pay interest on), let alone pay back when the creditors come calling. Think Greece. Even an annual 1 percent interest payment on $1 trillion dollars is a figure larger than most of us can conceive ($10 billion). Looking further afield, about 42 percent of U.S. public debt is held abroad; many central banks see borrowing in dollars (the world’s de facto reserve currency) as a way to stabilize their own currency or keep their savings safe. Japan and Mainland China together hold over a third of all U.S. debt abroad (a little over $1 trillion each at the end of 2016), according to Treasury figures. Treasury publishes monthly details about its creditors here. Presidents often like to boast that they’ve tamed the debt or the deficit. (A deficit is when the government spends more than it collects in a single year. Since 1966, the government has run a deficit 90 percent of the time.) Just as there are different types of debt, there are different ways of measuring and comparing it. One way is to total the deficits and surpluses from each year between the president’s second year (because an incoming president does not set the budget for his first year in office) and the year after that president leaves office. Another is to subtract the net public debt the first year after he takes office from the net public debt the year after he departs. The difference would be the net change during his tenure. Or look at a president’s specific programs and what they added or subtracted from the budget. The Congressional Budget Office (CBO), a nonpartisan government think tank that analyzes the budget for Congress, publishes this information. To compare deficits in different years, measure them against those years’ Gross Domestic Product (GDP). Observing net government debt as a share of total economic output (GDP) offers a way to analyze one country over time or to compare countries. The chart below shows how this figure has changed in the U.S. since 1790, according to CBO figures. 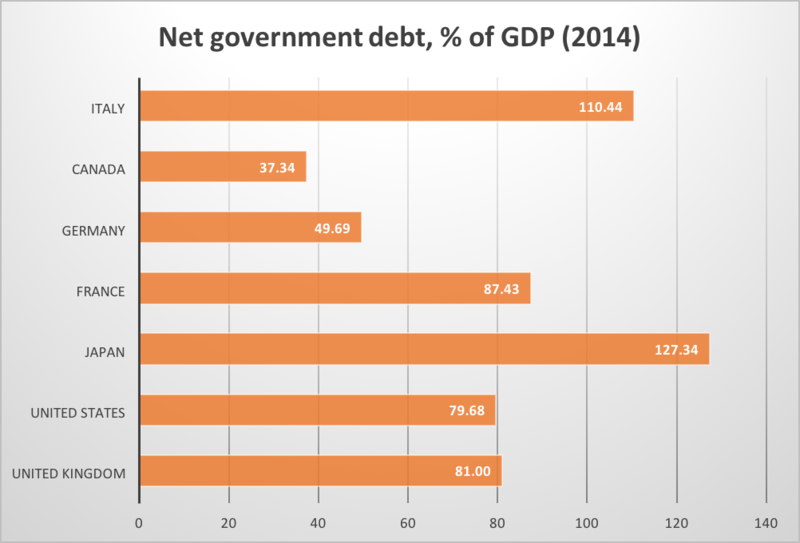 The next chart compares net government debt in the G7 countries using the most recent data available from the International Monetary Fund. That can look shocking, but the next chart multiples the one above by the 10-year Treasury rate – basically the benchmark interest rate at which the U.S. borrows money. This puts the cost of borrowing in context. 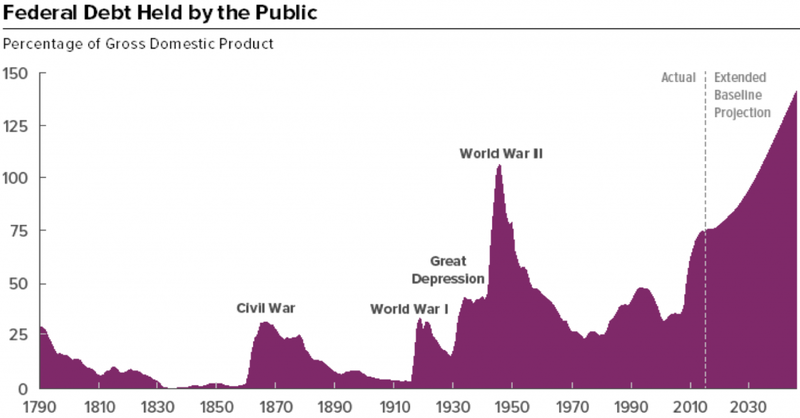 According to the St. Louis Fed: “This represents how much the debt costs, as a share of GDP. Here we see the cost is remarkably low – of course, thanks to low interest rates. […] Looking from this angle, some consider the debt to be too low.” Indeed, some – including President Trump – have argued that the country is not borrowing enough, missing a chance to invest in expensive projects like bridges and other infrastructure while the cost of borrowing is so low. And finally, measured as a function of GDP, the deficit declined between 2009 and 2015 as the economy grew (the major dip in the 1940s is how the U.S. funded its role in World War II). The debt ceiling (a.k.a. debt limit) is the legal limit, set by Congress, on the amount Treasury can borrow. “The debt limit is the total amount of money that the United States government is authorized to borrow to meet its existing legal obligations, including Social Security and Medicare benefits, military salaries, interest on the national debt, tax refunds, and other payments,” Treasury explains on its website. Congress eventually caved, but a few days later the ratings agency Standard & Poor’s lowered the U.S. credit rating nonetheless, suggesting U.S. securities were not as safe an asset as they had been. In theory, a worse credit rating means lenders demand higher interest rates, driving up the cost of borrowing. For now, the U.S. still remains the world’s safe haven, though the idea of default appeared again during Trump’s run for office, in 2016, when he left open the possibility that as president he would ignore Treasury’s obligations. The CBO issues regular reports focusing specifically on the federal debt, including a 2017 paper on the economy and budget in the decade ahead and a 2016 paper on options to reduce the annual deficit. The Congressional Research Service – Congress’s nonpartisan research arm – also publishes regular reports, including on topics such as the debt limit (2015), foreign holdings of federal debt (2016), deficits (2016), and how Treasury manages debt (2016). The Pew Research Center tracks the number of Americans who feel that reducing budget deficits are a top priority. Liberal economist and Nobel laureate Paul Krugman has argued that debt is a good thing and noted that though the United Kingdom has been in debt for over 300 years, it has done quite well for itself. Treasury has a helpful page of frequently asked questions. Investopedia explains how the roles of the Treasury Department and the Federal Reserve Bank intersect and overlap. Was Obama responsible for the surge in debt that began shortly before he took office? The Washington Post explains.